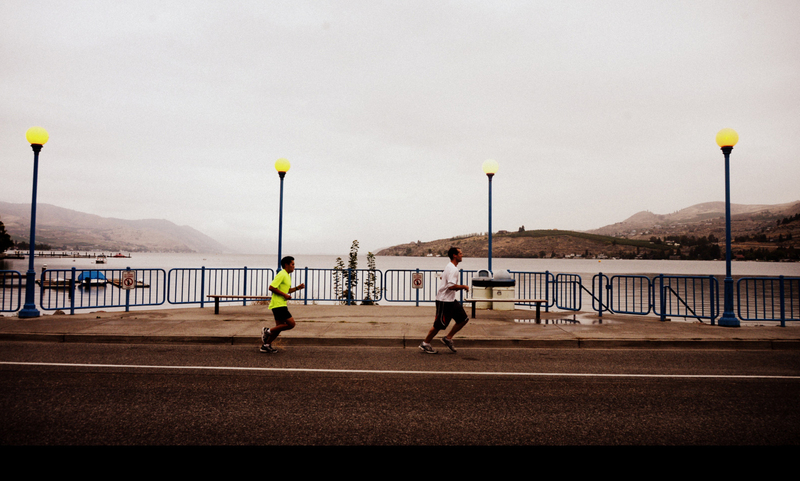 Runners head through Chelan on the way to Manson and the finish of Saturday's Lake Chelan Shore to Shore Marathon, Half-Marathon and 10K. 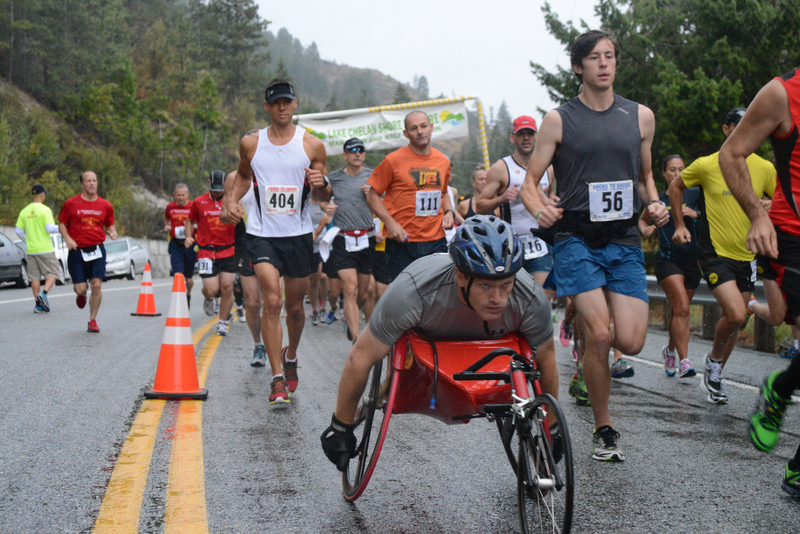 MANSON — It was a day of firsts at Saturday’s rainy Lake Chelan Shore to Shore Marathon, Half-Marathon and 10K, with a new record set in the men’s marathon and a new turnout mark established for the event. 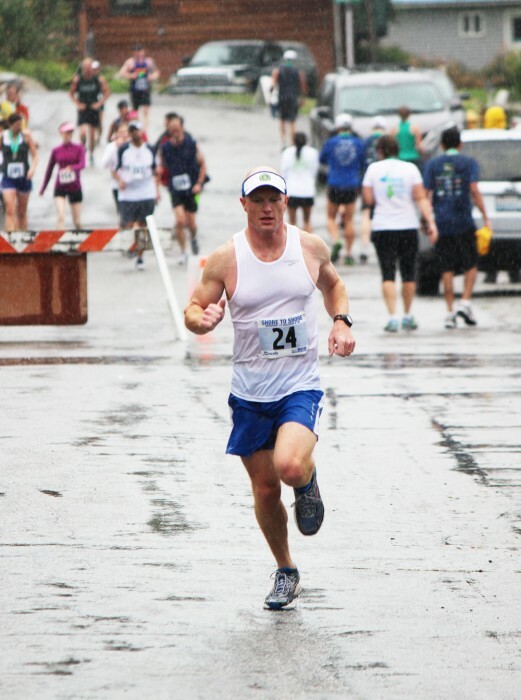 Depending on which runner you spoke to afterwards, the wet weather — steady rain fell for virtually the entire morning — either was a help or a hindrance to fast times. The wet weather also was a first — never had it rained so much and so long in the event’s 12-year history. What no one disputed was the record participation: A total of 605 registered for the event and 542 finished, smashing previous highs of 397 registrants and 344 finishers from a year ago. Seattle’s Bill Condon easily captured the men’s marathon in a time of 2:45:29, breaking the old mark of 2:50:50 set in 2005 by Brandon Hoglund of Wenatchee. For Condon, it was the first time he’d run Shore to Shore, although he’s no stranger to finishing atop marathon fields. Earlier this year, he won the Tacoma Marathon and the Coeur d’Alene Marathon. In June, he was fifth at the Seattle Rock ‘n’ Roll Marathon. His time Saturday was just five minutes off his own personal record of 2:39:18 set in last November’s Seattle Marathon. “It was fun,” Condon said. “The course was great. There are some ups and downs but it’s a great course. The organizers did a really fine job. They did a good job of controlling traffic and making sure everything was in place. Finishing second was Wenatchee’s Caleb Ambrose in 2:54:47. Ambrose said he cramped up a couple times, although the rain kept him cool. As for Condon, Ambrose said he lost track of him early on. “He took off fast right from the get-go,” he said. Jonathan Spears of Vancouver, Wa., was third in 2:57:13. Danielle Villarreal, the women’s marathon winner, enjoyed two victories on Saturday — capturing the Shore to Shore title in 3:10:57 and qualifying again for the 2014 Boston Marathon after being felled by a stress fracture just three weeks before this year’s Boston Marathon. 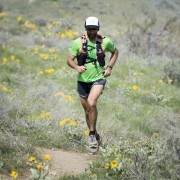 After taking several months off to recover, the Seattle runner began training again just a month ago. JoAnne Bernhardt of Joint Base Lewis McChord was second in 3:23:26 and Wenatchee’s Selina Danko was third in 3:25:40. Danko congratulated Villarreal afterwards, telling her, “You ran an awesome race.” Danko, who won the Shore to Shore Marathon in 2008 and the Half-Marathon in 2011, was in position to win again but Villarreal passed her at about the 20-mile mark. Asked to compare this year’s Shore to Shore with the one she won five years ago, Danko said the amount of support along the course was significantly better. Wenatchee's Selina Danko, right, finished third in the women's marathon. Spokane’s Rachel Jaten captured the women’s half-marathon, finishing the 13.1-mile course in 1:17:40. 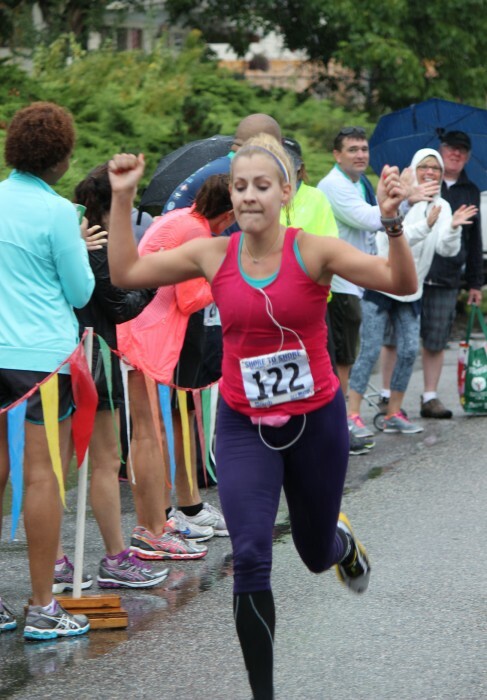 Jaten said she used the Shore to Shore Half as a tune-up to next month’s Portland Marathon, where she hopes to quality for the U.S. Olympic Marathon Trials. She described the Lake Chelan course as a good one with the middle part a “little tough,” particularly the hills coming out of Chelan on the way to Manson. The moisture falling from the skies wasn’t an issue, however. “I don’t mind rain at all,” Jaten said. 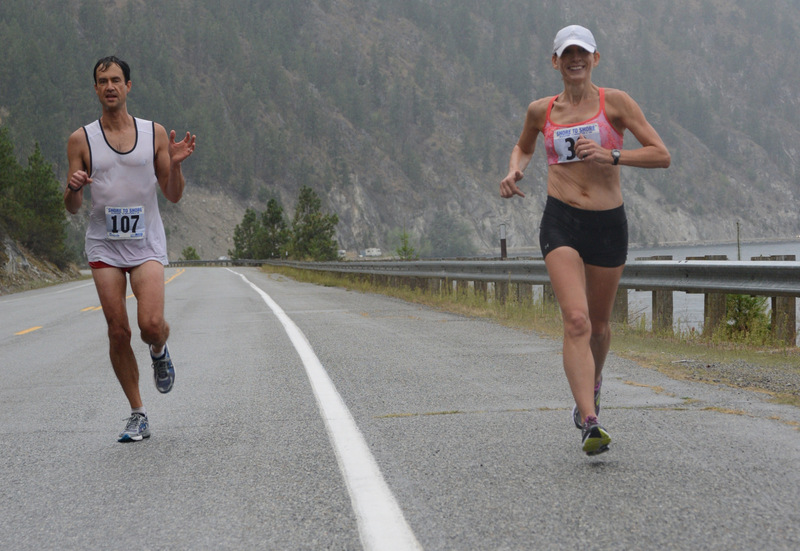 Last year’s women’s half-marathon winner, Lynda Finegold of Wenatchee, came in second in 1:29:24. Finishing first in the men’s half-marathon was Seattle’s Brig Seidl, who finished in 1:21:50. 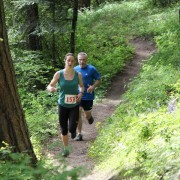 Kevin Saur of Snohomish captured the 10K men’s title while Traci Hamilton of Sammamish did the same on the women’s side. “It’s a pretty course and it’s flat, which is nice,” said Saur as his two sons, Ethan and Carter, stood nearby. Carter wore his father’s finisher’s medal. Coming in second was Luke Hakensen, 16, of Wenatchee. Third was Dennis Summers of Gifford. For Hamilton, it was her first official race since doing the Boston Marathon in 2007. She took a break after taking part in that storied event to raise her two children. “It feels really good,” Hamilton said of racing again. Runner-up in the women’s 10K was Christine Klingel of East Wenatchee, followed by Marisol Galeana, also of East Wenatchee. The youngest finisher on the day was 13-year-old Nathan Longhurst, who ran the full marathon and completed the 26.2 miles in 4:38:13. His parents said afterwards their son already is talking about running another one. For complete results, including age division winners: http://www.buduracing.com/.